The last time I posted on the subject of genetic mutations, methylation, and their possible connection to topical steroid withdrawal (TSW) was on April 17, 2014. At that time, we had just started on some vitamins and supplements (April 4th) prescribed by Brian’s naturopathic doctor to address his specific genetic mutations. So, how’s it going? Well, he hasn’t really gotten worse since starting the vitamins and supplements, and he has been improving. In fact, he has actually gotten a lot better in terms of energy and physical function in just the past 2 weeks. However, is this healing a result of the treatment for Brian’s genetic mutations, or is it just the natural healing progression of topical steroid withdrawal? I don’t know. The following “it” refers to: Brian’s treatment regimen that involves taking supplements and vitamins to support the inefficient or ineffective body processes caused by Brian’s genetic mutations. “It” also refers to genetic testing and supporting the methylation cycle. 1) Is it increasing the speed of healing? It’s hard to say. My idea of faster healing is that he would have been totally free of all signs and symptoms of TSW 1-2 months after starting treatment for the mutations. That would have been May 4th or June 4th. TSW stuff is still going on. Brian is in month 8; his projected healing time based on usage is 1.6 to 2.4 years or 19-24 months. Check back in month 10 to see if all signs and symptoms of TSW are gone. Maybe then we could claim faster healing? 2) Is it just another fad and a waste of money? It may be another fad, but I don’t think it is a waste of money. It’s kind of like getting tested for the breast cancer gene. If one has an abnormality or mutation in the BRCA 1 or BRACA2 gene, one has the option to do something about it to hopefully prevent the potential consequence: breast cancer. In Brian’s case, the genetic testing revealed gene mutations that decrease the effectiveness of his methylation cycle. He has several mutations that are gumming up his gears, resulting in: a build up of histamine (itch); decreased break down of catecholamines (body always on high alert=awake=anxious); decreased ability to break down nitrous oxide; potential for celiac disease/gluten intolerance; difficulty transporting and converting certain B vitamins (decreased glutathione, which is a powerful antioxident); and difficulty with energy transport. We hypothesized that these problems contribute to his itching, messed up sleep/wake cycle and emotional state, and are possibly why he was susceptible to TSA/TSW (still just a hypothesis.) So, we support these processes with the right vitamins and supplements so his body can run as efficiently as possible, and thereby create a better environment for healing to occur. 3) Is it doing anything? I believe so, and here’s why. WARNING: if you’re uncomfortable discussing bodily functions, skip this section. Like more people than you’d think, Brian would clog toilet every now and then with his bowel movements (BM). At first, I didn’t know it was him, so as the frequency of clogging increased, I started worrying that it was caused by tree roots getting into the plumbing. Over the first 5 months of TSW, it got worse, and he was clogging the toilet EVERY TIME he went with ginormous stools. It seems that the only thing wrong with the plumbing is that the pipes were just too small to handle what he was dishing out. By January, we’d send him to the bathroom with toilet paper in one hand and a plunger in the other. Evidently, we were not the only ones with this problem because when I googled “child’s large stools clogging toilet,” there was plenty of discussion on the subject. Ahhh, we are NOT alone! This continued as he started the supplements and vitamins on April 4th. On a follow up visit on May 19, 2014, the doctor did a systems review: How are you sleeping? Are you dreaming? How is your appetite? Any cravings? How is your energy level, etc. We had no major changes to report, but when she asked about bowel and bladder, I thought about it, and you know what? The toilet had not been clogged up in the past 3 weeks! He was also much less gassy since starting the supplements and vitamins. Before addressing the genetic mutations, he sounded like a gaggle of geese, honking their way south for the winter. His doctor was pleased and said that a lot of her patients with methylation problems report an improvement in their bowels and decreased frequency in toilet clogging after vitamins and supplementation. NO LYING! So, Brian’s gears (and the toilet) are getting unstuck. As of today, he is sleeping better, “itch festing” less, and can tolerate heat and sweating with much less discomfort than 2 weeks ago. Whether because of the treatment or just time, we’re heading in the right direction and moving beyond the itch. Proper functioning of the methylation cycle is crucial in keeping this machine we call our body functioning optimally. Methylation depends on the MTHFR and many other genes/enzymes. When mutated genes in the cycle gum up the gears, the body processes don’t work like they’re supposed to and then gum up other gears, resulting in symptoms we see in conditions like cardiovascular disease, cancer, diabetes, fibromyalgia, autism, bipolar disorder, frequent miscarriages, ADD/ADHD, (2) and poor wound healing, just to name a few. We cannot fix mutations, but we can try to provide what’s missing so that the gears start working again, and the body can function as efficiently as possible. Two ladies who do a nice job explaining the basics of methylation and MTHFR in their blogs are Tracy Scarpulla, and Meg. Tracy has an MTHFR mutation, and she believes that she is healing from TSW faster than “expected” because she is addressing the mutation with vitamins and supplements. Meg also has the MTHFR mutation; however, it contributed not to TSW but to a late-term miscarriage. 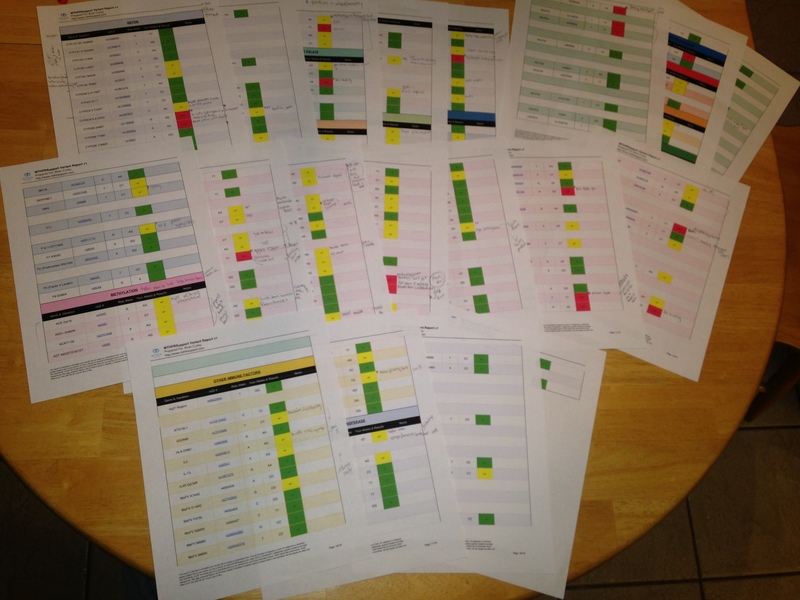 Brian’s 19-page Gene & Variation report prepared through MTHFRSupport.com and interpreted by his naturopathic doctor (ND). Genetic testing done through 23andMe. After analyzing 19 pages of results and Brian’s mutations, his ND determined that the gene mutations to address first and the enzymes that are most important for him right now are BHMT, CBS, COMT, MAO, MTHFR, and GIF. She chose the therapies that have key enzymatic reactions or support (inducers) to the rest of the system. His current therapy/treatment includes the following supplements: Magnesium, Molybdenum, Glutathione, and a B Complex from natural sources. Read ND & Genes for more information on Brian’s treatment. He is also taking 2000 i.u. of vitamin D3, as recommended by his pediatrician. I would ask for the name of her decorator, but the last time I spent a lot of thought, time, and effort feng shui-ing my bedroom, Brian and his dad turned it into a batting cage and baseball training area. In addition to the remedies and supplements above, Brian is also supposed to try to drink 40+ ounces of water daily, be active–running, jumping, playing, etc.–and take conscious breaths (deep-breathing) throughout the day. He is to do 10 resetting breaths to help calm his nervous system the itching feeling starts. Wow! Take a handful of natural supplements, pop a few drops of itch remedy, and breathe deeply. That just seems too easy! It is unless you have a 10-year-old who doesn’t like to take orders from mama…. Anyway, Brian’s had 13 days of supplements and 10 days of glutathione. In the first few days, there seemed to be an increase in furious scratching at night and a return of not being able to fall asleep until 1 am or 2 am, whereas he had been getting pretty consistent with falling asleep by 12am. He did complain of a minor headache 4 of 7 days after starting the glutathione, but it could have been from dehydration and lack of sleep. It could also be his body starting to detox, with the itch and headaches as symptoms. The topical itch ointment and remedies kinda sorta maybe worked but not enough for us to get more. On a positive note, he seems to have more energy (obviously more at night, since he won’t go to sleep!) and he has been able to be awake at 8:30am or 9am without having to doze off for another 2 hours before getting ready for the day. He has been up and active at least 12 hours for the past few days and has not had an itchfest meltdown (that was not instigated by mama.) These are improvements for us. I wonder how much of this is the therapy and how much is just the natural healing process of TSW. Three days until Easter. I am thankful for this promising new road to travel and still have faith that, sooner or later, Brian will be healed. I just want to clarify that “MTHFR” does not mean what you think it does even though the expletive certainly applies to topical steroid withdrawal (TSW) and this hell that currently is our life. Here’s a description from The Genetics Home Reference Guide. What is the official name of the MTHFR gene? The official name of this gene is “methylenetetrahydrofolate reductase (NAD(P)H).” MTHFR is the gene’s official symbol. MethyleneTetraHydroFolate Reductase? The expletive rolls off the tongue much easier….